Austria is a great and cheap alternative to full-blown snow holiday in the middle of winter. Primarily because in Austria you can ski all year round! WHAT? 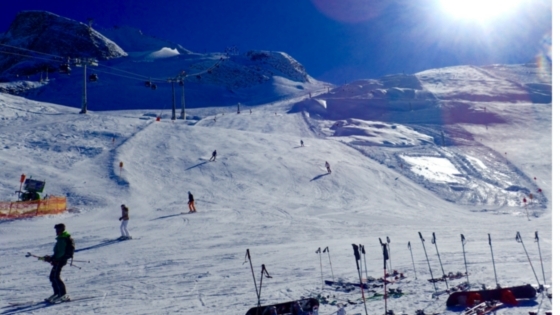 Yep, that’s right – they have the Hintertux Glacier that is so high up and so cold that there is snow on it all year round. Which is awesome if you are backpacking Europe and think that you may want a change from swimming in the Mediterranean. It is also something that is often overlooked by the backpacking crowd so the people you will meet up on Hintertux are die-hard snow lovers or Austrian’s. 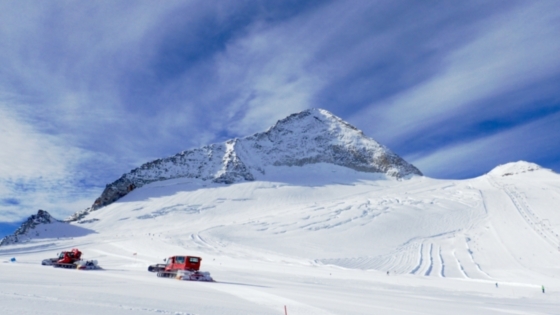 Hintertux can be easy to get to and from, but you may have to juggle your itinerary a little bit. The transport hub near Hintertux is Innsbruck – however, flights in and out of here are not the cheapest. It may be cheaper to get a train to Munich or Zürich (though if you go to Zürich – fly out straight away unless you are prepared to spend a lot of money). From Innsbruck there is an old-fashioned train that goes straight up into the mountains with its last stop being Mayrhofren – the gateway to the Hintertux valley.There is also a reliable bus system that links the train station of Mayronhof with the ski villages surrounding Hinertux Glacier. Austria has a great train system – the trick with trains in Europe is to book them early. That way you get the nice and cheap early bird prices. You need to pay a little extra to book a seat, annoying but can be worth it if you are travelling on the weekends. Getting from your accommodation to the Ski fields is also very easy as nearly all of the valley has buses that will take you there – and the cost is included in your lift pass. In and around Innsbruck there are plenty of youth hostels. However, unless you are skiing in winter this will mean you have an hour train ride to the snow everyday. I suggest staying in the Hintertux valley. Definitely look at AirBnB as there are some really great places on there all within walking distance of the bus stops that head up to the mountain. Another great thing the Austrian’s do is all-inclusive accommodation. Look on Booking.com and other sites for packages that include Half Board (includes breakfast, afternoon snack and a very delicious dinner) and Wellness (spa, sauna and heated pool). As having the cost of your meals included can work out more cost-effective, if you find the right deal. Try and go during the week – as there are loads of special deals on then. During the weekend it’s packed with local Austrian’s and Germans. There are plenty of places around that you can hire gear from – but not all of them hire clothes as well. Make sure you check before you start getting fitted with Ski boots. Bring your own ski gloves and socks. Normally, I say pack light and buy things along the way that you really need. 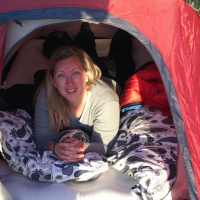 However, ski gloves and socks can cost you 50 Euros each… much easier to take them with you and then post the home when you are finished with them. 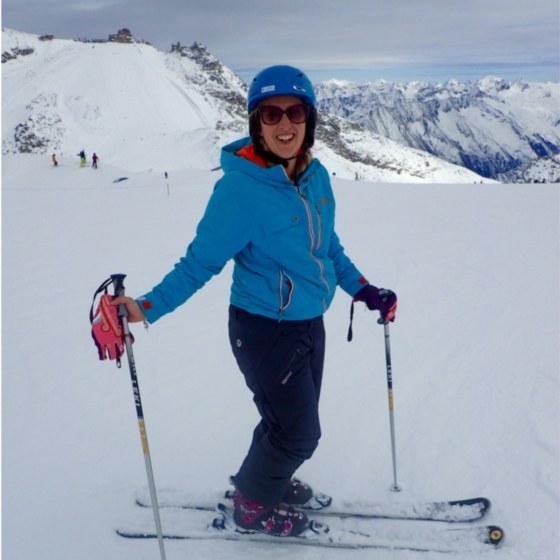 You can hire both clothes and ski’s on the glacier – it is a little bit more expensive, but it does mean that you can leave your ski’s there every night instead of lugging them down the mountain, onto a bus, and all the way home every night. Everyone wears helmets – no exceptions. When you are on the mountain and you see all of the rocks you can see why. If you are a novice staying on the easy runs you would probably be fine. If you are a pro and going on one of the slightly harder runs… definitely get a helmet included. 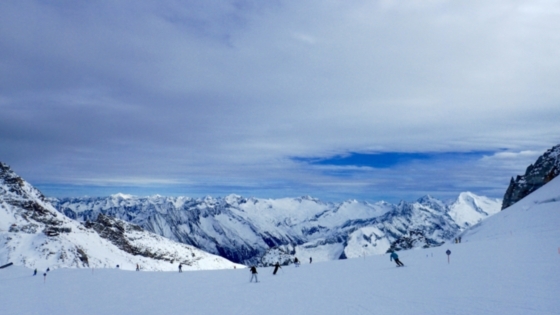 The slopes are big, steep and stunning – take several deep breaths when you reach the top and just look around. If you are a novice skier, I would recommend getting a morning lesson. You can do a group one for about 60 euros. Which isn’t the cheapest, but the confidence it can give you is priceless. If you are a pro – I would watch the locals for a bit to get your eye in. The only way to get back to the gondola lift home is to ski down the mountain… or so it seems. Actually in the middle of the ski field where all of the t-bars start there is a snow-cat hub. The snow-cat drivers are usually on hand to give children and novice skiers a lift back to the gondola. The beginner runs are like intermediate runs in Australia – however, everyone else on the mountain is very mindful of beginners. So even though they fly down at the speed of light – they stay far away from you and never cut in too close to you. Quite frankly, there is no need to as there is so much SPACE. Wear and pack sunscreen as being summer it’s generally sunny, add the reflection of the snow as well and you see some pretty nasty sunburns. Pack your own – it’s a lot cheaper. If you forget to pack your own, get down early as around 12 there is a rush akin to Beatle mania. The trick is to get to the front of the “queue” and yell your order at one of the serving girls, then keep reminding her until it comes out. Good luck. Bring water lots and lots of water. Make sure you time your departure right as like lunch time there are hordes of people waiting for the buses. Partake in some Wellness – especially the sauna. It is very easy to just curl up and have a nap, but trust me, some wellness makes walking the next day a lot easier. Get some local advise on which beers to try. There are some great ones unique to the region, and some they mix with juice to give you a sugar hit after a hard day of skiing. They are delicious! Check the weather report for the next day so you can decide if you are doing an all day skiing or just an afternoon. Have you been skiing in Austria? Any top tips that you would like to add? Thank you for sharing your great tips. Austria is a perfect place to ski.